Last July my friend Lesley wrote a post about wanting to open a book shop in Pittsburgh. I wrote a follow up post reminicing about all of the book shops that used to be open in Sq. Hill and Oakland. 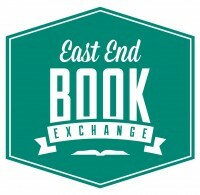 I am happy to write yet another post to tell you about the next chapter of East End Book Exchange! For the past year – the East End Book Exchange operated out of the Pittsburgh Public Market – open each Friday, Saturday and Sunday with an extensive collection of books for their little space. While the Pittsburgh Public Market may be struggling as a market – it has been the perfect incubator for Pittsburghers to test out their businesses before moving to a storefront. The Crested Duck Charcuterie started out in the public market before opening a store front in Beechview and they just announced they are expanding again! 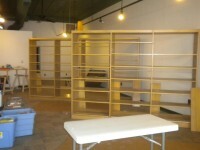 This Saturday the East End Book Exchange opens the doors to their new permanent location on Liberty Ave in Bloomfield. Just down the street from The Big Idea Bookshop – Bloomfield is the perfect home for a used book shop. There are also at least 3 other awesome resale shops on Liberty Ave – including the newly opened Clothes Minded. Making Liberty Avenue a perfect place for vintage shopping and browsing unique finds in clothing, books and more. Read more about the East End Book Exchange in Pop City Media here. Everyone is invited to their grand opening celebration on Friday night – get a sneak peek and pick up your favorite books before the shop officially opens on Saturday.